DIOLCH Yn FAWR to everyone who came to sing with us at our Gymanfa Ganu! We’LL KEEP A welcome until next year! Welsh (Cymraeg), the native language of Wales, is a living Celtic language, closely related to Cornish and Breton, and kin to Irish and Scottish Gaelic. It is one of the oldest living languages in Europe; the Welsh spoken today is directly descended from the language of the Sixth Century. Everyone in Wales also speaks English. Wales is the only nation to have entered this Millenium under the same Flag as it entered the last one! 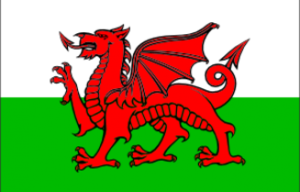 The Welsh Flag is the Red Dragon – shown below (Ddraig Goch in Welsh) – originally brought to Britain by the Roman Legions. Wales (Cymru (or “land of my countrymen”) in the Welsh language) is part of Europe, a region of the island of Britain, and a constituent nation of the United Kingdom. 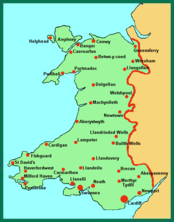 Wales is situated to the west of England, a peninsula about 170 miles (256 km) long and 60 miles (96 km) wide. Wales covers just over 8,000 square miles (20,720 square kilometers), about 15% more than the San Francisco Bay Area. One of the most famous titles Americans have heard of is the “Prince of Wales” – currently Prince Charles (his late wife, Diana, was Princess of Wales). Placing his newborn son on a shield, he invested the babe, saying of his Welsh language skills, “Well, he speaks no other”. The Welsh-American Society of Northern California (WASNC) celebrates Wales, its history and culture, and the Welsh people who immigrated to America. Wales has a rich and vibrant history going back to the pre-Roman Celts, upon which the myths of King Arthur and Merlin were based.